Ed. Var­ie is a gal­lery and pro­ject space cre­ated and cared by Kar­en Schau­peter loc­ated in the East Vil­lage, New York. Yes­ter­day Ed. 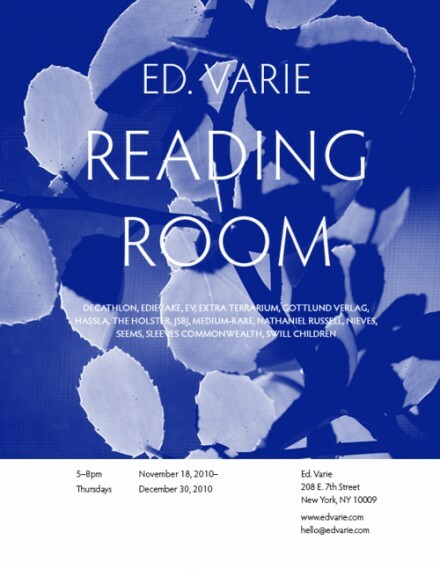 Var­ie opened a Read­ing Room, a pop up book shop with an amaz­ing cur­ated col­lec­tion of artist books and zines… The Read­ing Room fea­tures fol­low­ing pub­lish­ers: Book Club, Dec­ath­lon, Edie Fake, Gottlund Ver­lag, Hassla, The Hol­ster, JSBJ, Medi­um-Rare, Nath­aniel Rus­sell, Nieves, Seems, Sleeves Com­mon­wealth, Swill Chil­dren, and inde­pend­ent pub­lish­ers Bri­an Kanagaki, Aman­da Mar­s­al­is, Kim­berly Suth­er­land and Grant Will­ing, plant life by Extra Ter­rari­um.